Ground floor: Open plan living/dining room/kitchen (fireplace, TV, DVD, CD, WiFi, oven, microwave, dishwasher) with doors to terrace. Underfloor heating throughout the house (payable locally). First floor: Double bedroom. Twin bedroom. Shower room. Small study. Outside: Covered terrace to side of house and vine covered terrace in front of the house. Garage/barn (WC and pool shower in separate room, washing machine, table tennis). Barbecue. 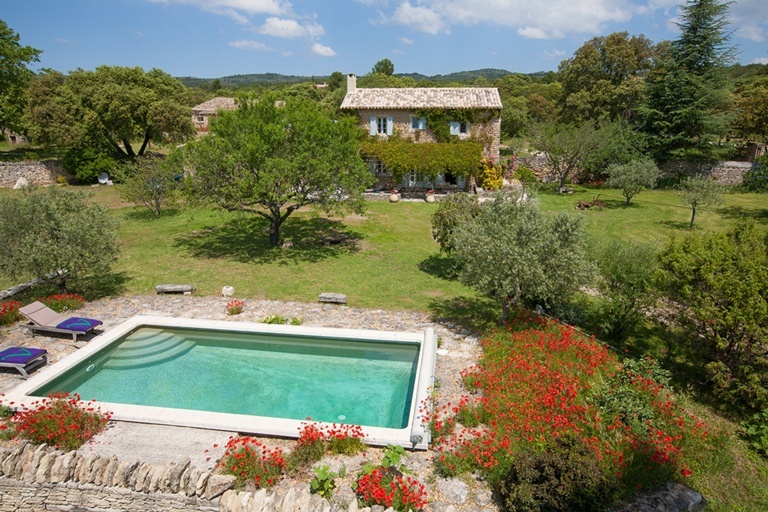 Large enclosed grounds of grass and olive groves. Private swimming pool (8m x 4m) with corner steps (open May onwards). It is rare to find properties that are perfect for a couple or small family so imagine our delight when we discovered Le Gustave, a pretty two bedroom stone cottage set amongst olive trees in the heart of the Luberon, close to the wonderful hilltop village of Gordes. This picturesque house is charming, with its lavender painted shutters and old stone 'borie' (ancient dwelling) by the covered terrace and is further enhanced by its spacious enclosed grounds covering one hectare. Careful restoration and attention to detail has ensured that original features have remained and are now combined with modern comforts and cosy décor to create a warm and welcoming atmosphere. There is ample space in the living room and kitchen with its dining area. From here, French doors lead out to the terrace for outdoor living. A beautiful tiled staircase leads up to the first floor where the pretty bedrooms have views across the countryside. From the shade of the vine covered terrace, you look out towards the pool and olive grove, and beyond to the hills across the valley. It will be difficult to move from this idyllic setting, but make sure you take the time to visit some of the captivating villages in the vicinity. Gordes (4km) is close enough to visit for an evening stroll or meal out, whilst places such as L'Isle sur la Sorgue (20km) with its amazing Sunday market, and Apt (20km) offer all amenities and are surrounded by beautiful countryside. Closer to home, the village of Les Imberts (1.1km) has a restaurant and there is a supermarket and boulangerie in Coustellet, 3km further on. the stone building set amongst olive trees is typical of the area. The large grounds are great for children, whilst the adults will no doubt simply enjoy relaxing on the terrace. Avoid the crowds and visit Gordes in the evening. This beautiful village, perched on the hillside, has some lovely buildings and the most fantastic views. Have dinner there or a stroll around the streets when it is quiet. Visit the Village de Bories, just outside Gordes. The Village de Bories consists of the typical stone shepherd huts shaped like cones. Wander around and see how life was like many years ago. The shape of the huts will remind you of the one at the back of Le Gustave itself. where there is the most amazing market that goes on until lunchtime. Home to the most number of antique shops outside of Paris, Sundays see the streets filled with antique dealers selling their wares, as well as a fantastic Provençal market where you can buy everything from fresh fruit and olives to handmade soaps and artwork. The little village of Coustellet is not far from Le Gustave. There is a farmers' market held there every Sunday. You will also find the boulangerie there for your fresh croissants in the mornings. Perfect for a lazy morning on the terrace. to Sault, famous for its lavender fields. Go at the beginning of July to see the area awash in the colour purple, or go on 15th August for the Fete de Lavande, held in Sault itself. wrapped in dried chestnut leaves and tied with a raffia ribbon. More than 600 000 banon cheeses are made each year! Make sure you try at least one during your stay. the capital of the Vaucluse. Head for the car park called 'Parking Palais des Papes'. This underground car park is underneath the Palais des Papes square and so when you surface, you greeted with an awe inspiring view of the Palais itself. is a very pretty village, dominated by its chateau. Visit the chateau or explore the narrow streets lined with art galleries, cafes, and craft shops. Try the local sweet snack called gibassier which is a sweet cookie made with olive oil, shaped like an oval leaf and about a foot long. or between April and October on a Tuesday morning too. Once you are stocked up on fresh fruit, bread, olives, have lunch in one of the many cafes. home to rock formations, and the most vivid red hued soil you will have ever seen. The colours span the spectrum of reds, oranges and yellows and are truly amazing. The village itself is a delight to wander around with its arty shops and lovely cafes. So many books have been written about Provence. Take some with you and let the towns and villages come to life. 'A Year in Provence' by Peter Mayle, Jean de Florette and Manon des Sources by Marcel Pagnol are a few that spring to mind. You are not far from the restored villages of Ménerbes, Oppede le Vieux where much of 'A Year in Provence' was based. offers a tranquil and spiritual experience. Follow one of the guided tours around the monastery, which has been there since 1148. Go in June/July to see the full effect of the lavender fields in front of the Abbaye. by visiting Forcalquier (45 min drive) - a lovely town with a large main square bordered with plane trees and cafes, overlooked by its citadel. It's worth climbing to the top to experience the view across the town and the fields. to count the fountains. There are 40 in total dotted around the village. To help you, the town's tourist office has printed a map on which they are all marked. (you can cycle but it is so much easier driving!). Take a jumper, as even in the summer it is cold at the top. There are lots of picnic spots on the way up with large information panels about the amazing and varied flora and fauna that you can find on the mountain. (just under 1hr's drive), at the bottom of the Alpilles hills. A chic and pretty town, for a time, it was once home to Van Gogh. Follow the self-guided walking trail around the town - 21 signposts are dotted around the town, each with a reproduction of one of his paintings and an explanation in French and English. great for both children and adults. Take the audio tour and discover the history behind this amazing ruin on top of a huge rock!